It won't be easy to top their first trip to see the Minnesota Timberwolves play at Target Center for Caden, Caleb and Mackenzie George. 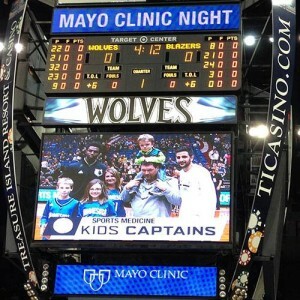 First, their family was given tickets to the game on Saturday, Dec. 5., as part of a community-focused Mayo initiative called Mayo Clinic Night at Target Center. The family planned to make the most of it by going early. Then they learned that the Timberwolves had "something special" in store for them. Before they knew it, they were sitting courtside for the team's pregame shootaround, and shaking hands with Timberwolves Andrew Wiggins and Zach LaVine. 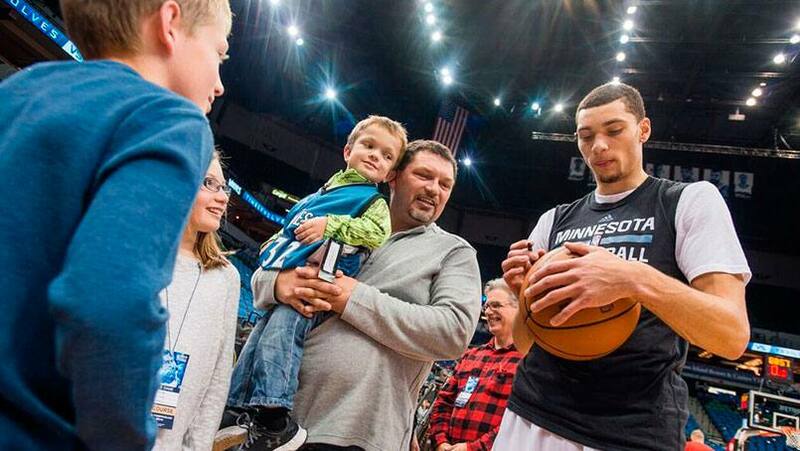 Wiggins and LaVine took a break from warm-ups to greet the family, pose for photos, and sign an official NBA basketball that the Timberwolves gave to Caden along with a team jersey that he wore proudly during the game and didn't want to take off that night, according to his dad, Tracy George. The Timberwolves also provided the family with seats near the basket for the game against division rivals the Portland Trailblazers. Caden was working on his basketball moves in the aisle during the game, we're told, and dribbling and jump-shooting his way through the skyway afterward. For the Mayo Clinic night event, Mayo extended an invite to local community groups – YMCA branches, Boys and Girls Clubs, and many other community partners – from both Rochester and Minneapolis. About 1,300 youth and their families attended. "It was awesome," Tracy tells us. "My boys will follow Andrew Wiggins now and Zach LaVine for the rest of their careers – I can guarantee that … really super guys." He added, "We just would like to thank Mayo – everybody that was involved in setting it up. Also, we'd like to put a thank-you out there to the Timberwolves. They were just amazing." We won't cry foul if you'd assist us by sharing your comments below and share this story with others using the handy tools atop this page.